The level of exhaustion that I am currently at is borderline dangerous. The past several weeks have been pretty busy for me from being insanely ill with a viral infection and gastritis, to going to Disney World for a food blog conference (which was awesome btw), and packing up an apartment all by myself and then physically moving. Whew. I could definitely use a break. 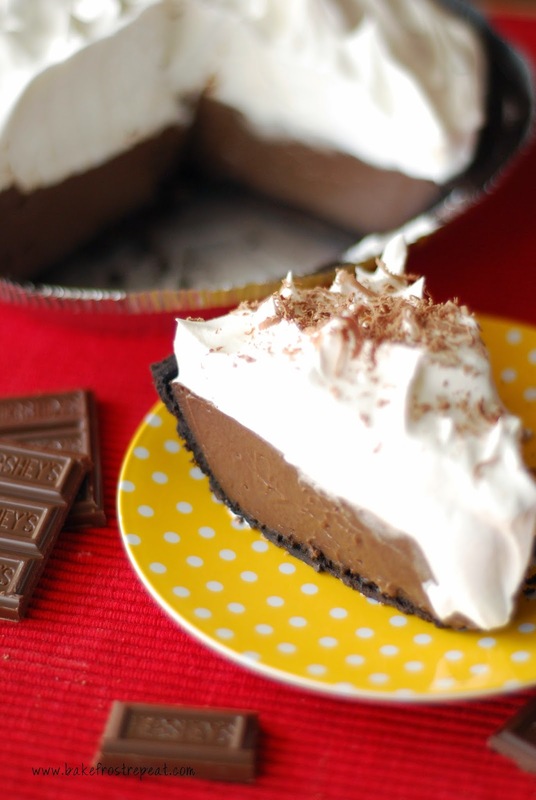 While taking said break, I would love to have this Creamy Milk Chocolate Pudding Pie right in front of me. I made this pie over Thanksgiving and everyone raved on and on about it. No instant pudding here!! You make the pudding from scratch, but I will say, it is definitely worth the extra work. Stir together the sugar, cornstarch, cocoa and salt in a saucepan. combine the milk and egg yolks in a bowl. Gradually blend milk mixture into the sugar mixture. Cook over medium heat, stirring constantly, until mixture comes to a boil. Boil and stir for 1 minute. Remove from the heat and stir in the butter and vanilla extract. Add the chocolate bar pieces and stir until melted and mixture is well blended. Pour into crumb crust. Next, press plastic wrap onto the filling. Refrigerate several hours or until chilled and firm. Remove the plastic wrap and garnish with whipped cream or cool whip. This looks SO good! My mother-in-law makes something that looks/sounds just like this, and it is my favorite dessert she makes. I'm going to have to try yours and see if it tastes just as good - it certainly looks like it will. YUM! Gosh this sounds heavenly. My sweet tooth has been out of control lately. I want to faceplant in this and eat my way out! This looks incredible, Shannon! Love that you made the pudding - it looks so creamy and delicious. This looks wonderful! It even sounds incredible. I love a pudding pie especially a chocolate one! This pie looks so creamy and delicious!!! Trusted Provider of Voice/Data Cabling Networks, VOIP, PBX, IT Support and Surveillance Cameras Installation in Long Island, New York. If you searching TOGEL SINGAPURA TERPERCAYA , then the team of professionals from our best gaming sites MAIN TOGEL ONLINE is here to help you. Always prepare before you make a choice. There is so much info about OUR betting sites MAIN JUDI ONLINE at BANDAR SABUNG AYAM TERPERCAYA For more CLICK HERE consult the experts at this site. It is so pleasant to work with experts. Click here to find out more regarding TANGKASNET TERPERCAYA. In case you're interested in knowing more info about our tembak ikan games CEME ONLINE TERPERCAYA , you can click this site . Are you looking for the best online gaming poker site? Then click this "SITE" if you search BANDAR POKER ONLINE . That is what you are looking for. Visit this site and enjoy the best gaming sites everyday! Are you looking for AGEN BETTING ONLINE ?Check out our sites The passionate experts in this field are ready to answer all of your requests. bonus agen judi online made a real revolution in the industry. The professional company bonus judi online provides all the information on situs judi online . click this sites and you will get what you want , there’s so many bonus BANDAR JUDI ONLINE this site TOGEL SINGAPURA TERPERCAYA come , register and play together with us. this is quite interesting news, and useful thank you for sharing the story in this article.